With a much more competitive economy than ever before, it is crucial to nail your job interview. There are several tips and strategies that you should follow to get the most out of your job interview and guarantee the highest chance of success. Peggy Klaus, a communications and career coach, advises a job seeker on how to properly conduct a job interview. Topics that are covered include grammar and vocabulary, eye contact, body language, vocal tone and more. All of the smallest details matter when it comes to the job interview, and this DVD covers some of the most important. During the job interview, Peggy feeds instructions to the job seeker through an earphone receiver. Peggy focuses on training the interviewee and dispelling false ideas and expectations, and encourages him to be proactive with the interview. With Peggy�s training the job applicant learns some of the most important aspects of conducting a successful interview and shows him how to break bad habits that can cost a person the job. This video is packed with useful information for any potential job seeker and is a great source for people who are entering the workforce as well as those who are transitioning into a new job or career. Value of a Job Skills Coach (3:21) � Two lessons where a career coach assists a Boston college graduate with preparing for his job interview. The first lesson is about �driving� the interview. The second lesson is about answering interview questions. Habits to Break for a Job Interview (02:47) � This is a third lesson that includes instructions on voice inflection, how to not turn answers into questions, and instructions to stop using the word �like�. 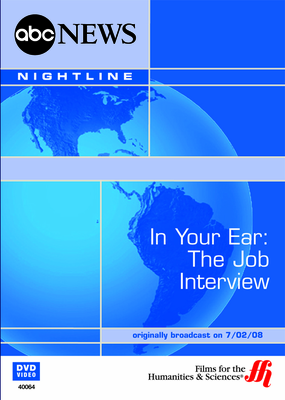 Job Interview in Session (02:52) � The interviewee wears a small earphone to get instructions from his career coach as he conducts a live interview.